I’m a Maryland girl, so crab is in my blood. I grew up on summer crab feasts, the Maryland version of a New England clambake. Imagine a picnic table covered with newspaper and filled with whole steamed crabs coated in Old Bay Seasoning. It’s a hands-on meal, where you crack the shells open and painstakingly pick the meat from the crabs. The seasoning clings to your fingers, conveying a spicy burn with every bite. It’s communal and festive and delicious! For fancier occasions, there was crab Imperial, typically restaurant fare, though my mother was known to make it on occasion. Lump crabmeat is mixed with mayonnaise, the requisite Old Bay Seasoning, stuffed into a crab shell (or a baking dish), topped with breadcrumbs and cheese, and baked until bubbly. What an indulgence. And of course, life wouldn’t be complete without Maryland crab cakes. While hardly everyday fare, crab cakes were a special occasion dinner we ate at home, the kind of thing you might pick for Mom to make for your birthday. Crab meat is bound together with egg and mayo, and of course that Old Bay Seasoning, and formed into patties, then fried or baked. Clearly, my relationship with crab leans towards serving it warm with Old Bay. 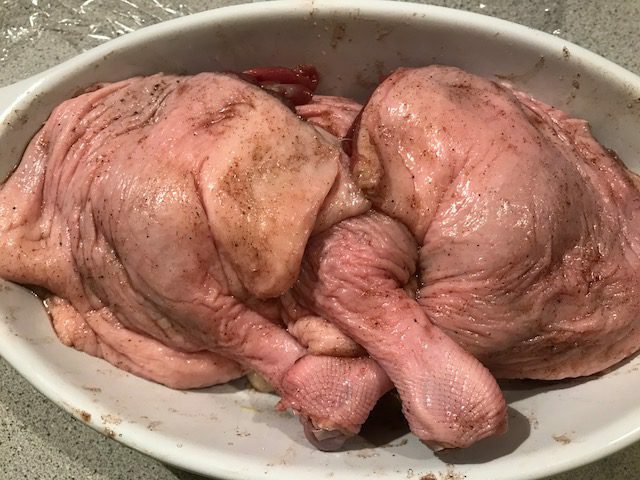 This week’s recipe choice for Cook the Book Fridays went in another direction. 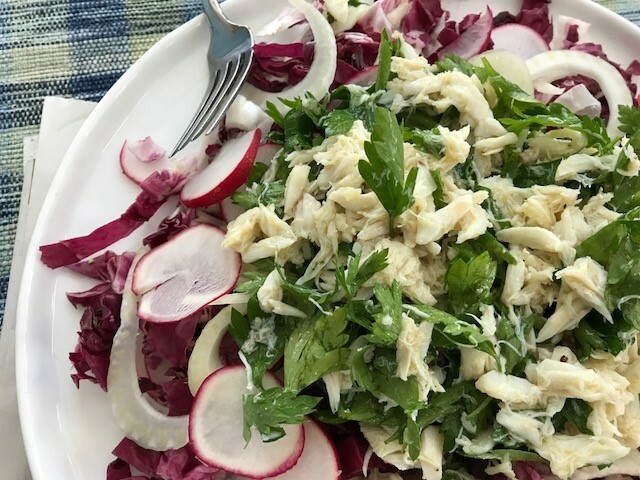 Fennel, radish, orange, and crab salad is served cold and combines a set of flavors I’d describe more as California than Maryland. This recipe fit perfectly into my weekly cooking schedule. Our tradition for many years is to spend Christmas Eve with friends celebrating the Italian Feast of Seven Fishes. This year we had 10 different kinds of fish or seafood. Typically, Howard makes a gravlax and I make mini-crab cakes. (This year, I also brought a batch of brandade.) Knowing I would be making this salad, I set aside some of the crab meat before I mixed up the crab cakes. I loved the vibrant colors in the salad. 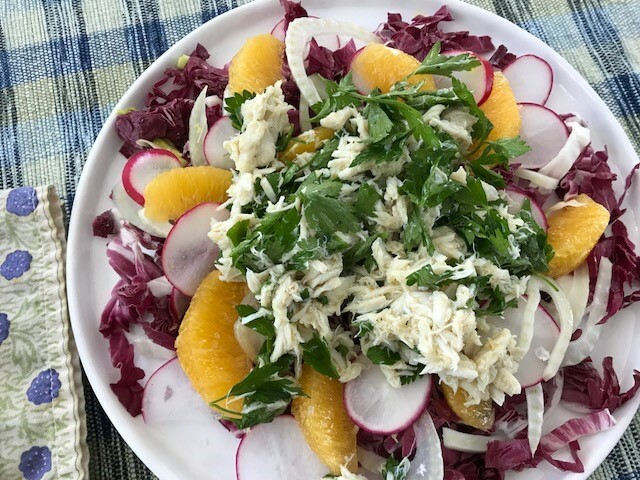 Though the fennel and crab were neutral, the rich burgundy leaves of radicchio, the pink radish skins, the green flecks of parsley, and, at least on my plate, the accents of orange segments created a festive palette. It tasted good too. 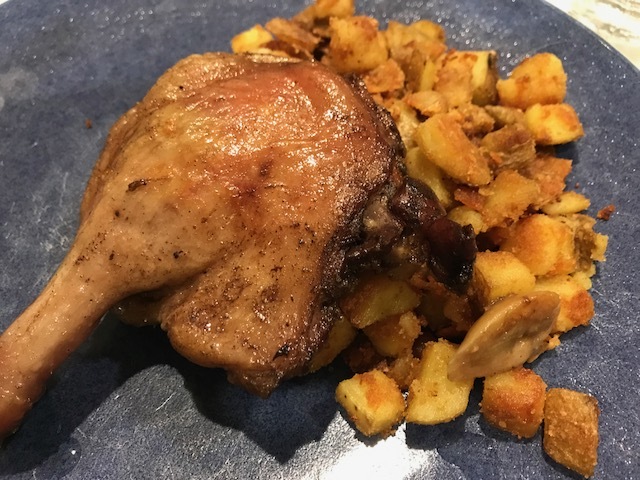 The salad is in the “First Courses” chapter of My Paris Kitchen, but a larger portion served for lunch makes a healthy, light, yet satisfying meal after the many indulgences of December. My only complaint is with the quantity of dressing. 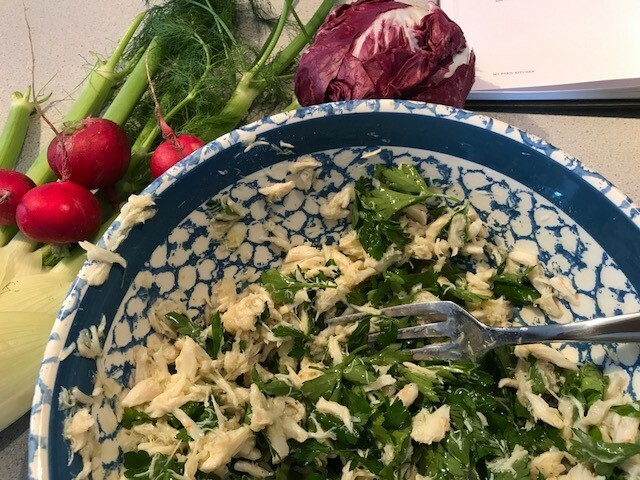 As instructed, I tossed the crab and parsley with the dressing. However, after I spooned the mixture over the greens and other vegetables, no dressing remained in the bowl to spoon over said greens and other vegetables, leaving them a little bit dry. I was too lazy, but simply doubling the amount of dressing would have solved the problem. To be sure to have some left, I’d mix half (the original amount) in with the crab and reserve the other half to drizzle over the vegetables before adding the crab mixture to the plate. You don’t really need a recipe to make this, but you can find it on page 90 of David Lebovitz’s My Paris Kitchen. 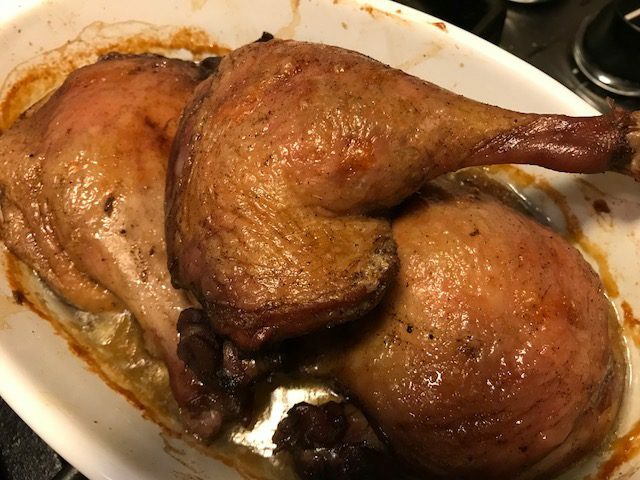 To see what other cooks thought of the recipe, follow their links here. Wishing you a Happy, Healthy, Peaceful New Year in 2018! Happy Cooking!